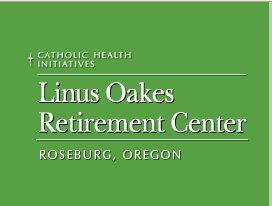 Nestled on an oak-covered hillside in Roseburg Oregon, Linus Oakes offers a lovely city view, yet is close to shopping, entertainment and medical care. Residents enjoy the variety of amenities and carefree lifestyle of our independent living community. Our community prides itself in our excellent dining experience, superior maintenance and housekeeping services, and a caring staff. We are dedicated to providing our residents with exceptional personal service and a comfortable and safe atmosphere Linus Oakes Retirement Center is a community within a community. With three libraries, a fully equipped woodshop, a large recreation room with pool table and big screen TV, a resident garden, an elegant dining room and more, you'll have no problem finding something to occupy all that spare time that living at Linus Oakes will free for you. Linus Oakes residents have the opportunity to enjoy a variety of activities with other guests, from shopping trips and entertainment outings to outdoors events. Outside of our own community the beautiful Thousand Valleys of the Umpquas awaits. From an array of cultural activities to a bounty of recreational opportunities, thereâ€™s never a shortage of things to do and see in the Roseburg area.